While I enjoyed experiencing this story again. I have to admit there was a little bit of a loss in the audio for me. Derrick McClain was once again the narrator for this one and before I go any further I just want to say I think the tiny issue here is truly a case of it's me. For some reason this time around there were a couple of times when Calvin's voice wasn't quite working for me. Most of the time it was good so I really can't say for sure but there were a couple of times where I just didn't find Calvin's voice as distinctive as I had in the audio book for 'The Mystery of Nevermore'. This combined with the fact that Seb and his lies of omission actually irritated me even more and there were times that I simply found Seb to sound whiny and honestly, whiny is just one thing that I don't do. While the mystery part of this story wraps up within the pages of this book, we're still left with a lot more to go when it comes to Seb and Calvin's relationship. Calvin's got his own issues to deal with and he's finally realized that a future with Seb means it's time to deal and Seb's on board to be the loving and supportive boyfriend that Cal needs so I'm also on board to see where things go between these two and if we could just get Seb to stick with selling antiques and not solving mysteries maybe Calvin's stress would be reduced a bit more as well. I still enjoyed the story overall, I'm wrapping this one up at 4 stars rather than the original 4.5 stars that I'd given the e-book. 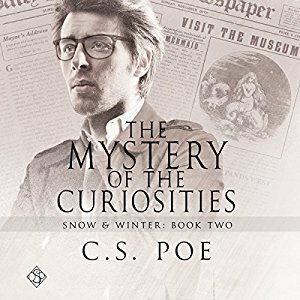 An audio book of 'The Mystery of the Curiosities' was graciously provided by the publisher in exchange for an honest review.